I'm using the excellent biblatex package with the author-year style and want the links in my citations to include the name of the author as well as the parentheses. The answer presented at hyperlink name with biblatex authoryear did exactly what I wanted but it seems the solution is broken with the newest biblatex version 1.4b. Can anyone help me by adapting the code to the newest biblatex version? 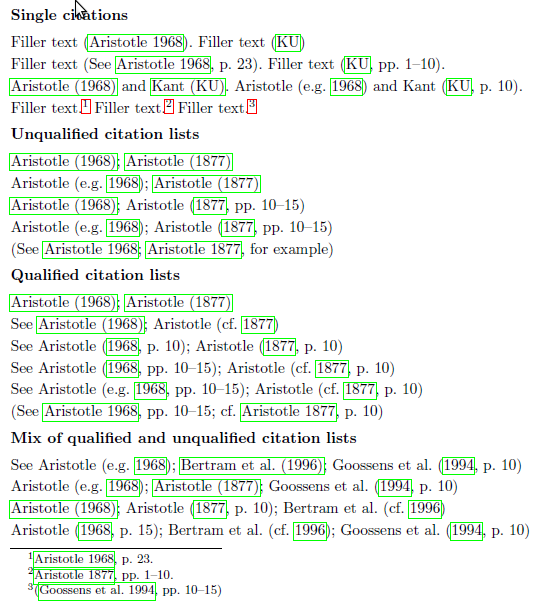 The code below hyperlinks the entire citation label for most citation commands. For \textcite the hyperlink includes the brackets around labelyear+extrayear, unless there are pre- or postnotes. In this case the link is applied only to labelyear+extrayear. Here is the output you should obtain with biblatex 2.6 or earlier. The solution also works for later releases, where \textcite and friends use the and string as a final citation delimiter. Not the answer you're looking for? Browse other questions tagged hyperref biblatex or ask your own question. Difference between biblatex and biber? How to change the color of first half of parenthesis in citation?